This section contains all the parts that are available specifically, for the AA truck. (Many of them also fit the BB Truck). Other items such as engine parts etc. can be found in the normal Ford Model A sections. AA Truck Wheel Nut 1928-29 Right Thread. The acorn style nut used on the 28-9 AA Trucks. These are authentic in every detail! Cad plated with R or L stamped on the face. Made in USA. AA Truck Wheel Nut 1928-29 Left Thread. The acorn style nut used on the 28-9 AA Trucks. These are authentic in every detail! Cad plated with R or L stamped on the face. Made in USA. AA - BB Truck 1930-70 Front Wheel Nut RH Thread. Made in USA. Some of the english vehicles use these on the front and rear. 1 ton truck uses them on the rear. AA - BB Truck 1930-37 Front Wheel Nut LH Thread. Made in USA. Rear Wheel Stud AA Truck 3-15/16" RH Thread. Rear wheel stud for the 30-1 AA Truck only. 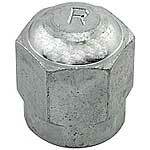 Rear Wheel Stud AA Truck 3-7/32" RH Thread. Rear wheel stud for the 30-1 AA Truck only. Rear Wheel Stud AA Truck 3-1516" LH Thread. Rear wheel stud for the 30-1 AA Truck only. 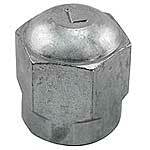 Rear Wheel Stud AA Truck 3-7/32" LH Thread. Rear wheel stud for the 30-1 AA Truck only. AA Truck Hub Cap Wrench 1930-31. Fits the 30-1 screw-on style hub caps. Made in USA. AA - BB Truck 1930-70 Inner Rear Wheel Nut RH Thread. They hold the inner wheel on. AA - BB Truck 1930-70 Inner Rear Wheel Nut LH Thread. They hold the inner wheel on. AA - BB Truck 1930-70 Outer Rear Wheel Nut RH Thread. These hold the rear outer wheel on. AA - BB Truck 1930-70 Outer Rear Wheel Nut LH Thread. These hold the rear outer wheel on. AA Truck Rear Wheel Seal 1928-29. For the AA-Ton Truck. 3.85" OD. Made in USA. AA - BB Truck 1930-34 Rear Wheel Seal. 4" OD. Made in USA. AA Truck Bearing Retainer 1928-31. They go under the nut that holds the front hub to the spindle. Made in USA. Front Wheel Inner Bearing for the AA Truck 1928-29. AA Truck 1928-29 Front Wheel Bearing Inner Race. AA Truck 1928-29 Front Wheel Outer Bearing. 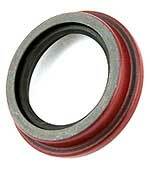 AA Truck 1928-29 Front Wheel Bearing Outer Race. Front Wheel Inner Bearing for the 1930-37 AA and BB Truck. AA & BB Truck Front Wheel Bearing inner race 1930-37. Front Wheel Outer Bearing for the AA - BB Truck 1930-37. AA Truck Spare Tyre Centre Cover 1930-31. Covers the centre hole of the wheel for the side mounted spare tyres. 1930-31 only. Made in USA. AA Truck Side Mount Arm Grommet 1929-31. Thin rubber grommet that was used on sheet metal where spare tyre arm passed through. Made in USA. AA Truck Brake lining kit. This lining set, is enough to do one axle (2 wheels). Uses 3/16" rivets which are included. AA Truck Brake Spring Kit 1928-31. Each kit contains 2 long and 2 short springs as illustrated which is enough for 2 wheels. For the 14" drum. Made in USA. AA and BB Truck Brake Wedge 1930-36. AA Truck Rear Brake Camshaft Bushing set 1928-31. AA Truck Brake Camshaft Spring set 1928-31. For the rear brake camshafts. Made in USA. AA Truck Dust Rings 1928-31. A pair of felt seals for the rear brake camshaft. Made in USA. 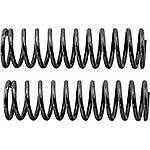 AA Truck Rocker Arm Springs 1928-29. Rear brake rocker arm retracting springs. Latest of 3 styles. Made in USA. This kit is used on the 1928-31 AA truck emergency brake bands. One set is enough for both left and right rear wheels. 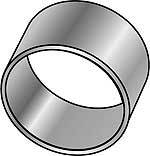 Linings are 1-1/2" wide, 41-5/32" long and the correct thickness of.175/,185". 40 Brass rivets are included for the installation and the linings are not drilled. 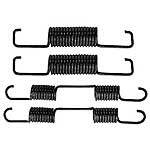 AA Truck 1928-31 Handbrake Retract Spring Set. 6 piece strong kit that retracts the emergency brake band. One kit will do both rear wheels. Made in USA. 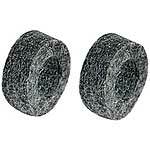 AA Truck 1928-31 Brake Lever Bushing set. For the emergency brake levers. Set of 4. 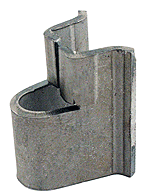 AA Truck 1928-32 Split Lever Bushing set . Split bushings that have the rounded centre. Used on the emergency brake levers. Set does 2 levers. Made in USA. AA Truck 1928-29 Front Brake Rod. 50 1/2" long. Measured from end to middle of eye. AA Truck 1930-31 Rear Brake Rod. 65-5/16" long. Measured from end to middle of eye. AA Truck 1930-31 Hand Brake Rod. 63-5/8" long. Measured from end to middle of eye. Special long nut used with the king pin locking bolt. Set of two, Made in USA. Used on the 5.14 high speed rear ends. Raised letters as original. Made in USA. Rear End Gasket Set 1919-29. For the worm drive style rear end. This set also is used for the TT Trucks. Made in USA. 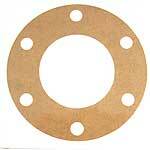 This gasket set is for the bevel gear style of rear end that was used from 1929-31. Made in USA. 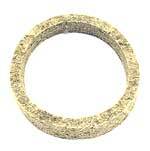 Axle Housing Cap Gasket 1919-29. AA Truck Differential Bearing 1930-31. This is the differential bearing for the 30-1 AA Truck. Made in USA. AA Truck Differential Bearing Cup. The cup for the 30-1 AA Truck differential bearing. Made in USA. Axle Keys 1928-30 3-1/2" long. Two different length keys were used. Some of the early bevel gear rear ends still used the shorter keys. Made in USA. Axle Keys 1930-31 4" long. AA truck Hub Gasket set 1928-29. This seal goes against the rear wheel hub befor the washer and nut go on the end of the axle. Made in USA. 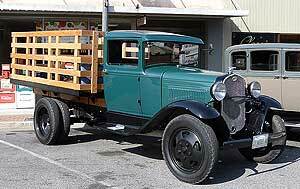 Hub Washers 1928-29 AA truck. These steel washers go under the rear axle nuts. Setr of 2, Made in USA. Hub Washers 1930-31 AA truck. Rear Axle Nut 1928-29 AA truck. Used on the worm drive rear end. Made in USA. Axle Seal 1928-29 AA truck. These seals go inside the rear axle housing and keep the rear end oil from leaking on the brakes. AA truck Axle Seal 1930-31. Housing Cap Shim 1928-29 AA truck. Universal joint housing cap shim. The steel shim is about .072 thick and comes with a gasket. For the worm drive rear end. Made in USA. Pinion bearing race for the 30-1 AA Truck only. Made in USA. AA Truck 1930-31 Pinion Bearing. Made in USA. The special pinion bearing with sleeve for the 30-1 AA Truck only. Made in USA. 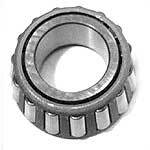 Retainer for the driving pinion pilot bearing. Comes with rivets. Bevel gear axle. This rivets that hold the pinion pilot bearing retainer in place. Drive Shaft Seal 1928-31 AA truck. Worm Drive Grease Seal 1928-29 AA truck. This seal goes just ahead of the front roller bearing in the rear end. It keeps the rear end oil from entering into the torque tube. Worm Drive. 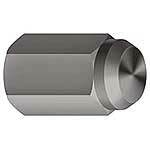 For the coupling shaft on the dual high transmission Ford #A22438. Two felt rings for the coupling shaft housing an the AA Trucks. Coupling Shaft Housing Seal Kit for the late 1931 AA Truck. 1928-29 AA truck Bearing Retainer for the coupling shaft. The thrust washer for the coupling shaft revolving thrust on the 1928-29 AA truck. This is the stationary thrust washer in the coupling shaft assembly for the 1928-29 AA truck. 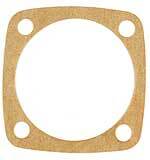 This gasket set is for the dual high transmission that was used on the 1928-29 AA truck. PTO Cover Gasket for the 1928-29 AA truck. 1 3/4 inch bracket, used on the AA trucks when U-bolts were used to hold the bed or platform to the frame. 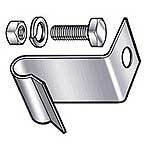 The U-bolt passes through the end of the bracket, opposite side of the bracket slips between frame rail to prevent it from being bent or collapsing when tightened. 4 inch bracket, used on the AA trucks when U-bolts were used to hold the bed or platform to the frame. 5 1/2 inch bracket, used on the AA trucks when U-bolts were used to hold the bed or platform to the frame. 6 1/2 inch bracket, used on the AA trucks when U-bolts were used to hold the bed or platform to the frame. AA Truck Outlet Pipe Bracket 1928-30. For the 131" wheel base AA Trucks, this bracket attaches to the frame and holds the muffler tailpipe. Mounting hardware included. Made in USA. Pair of Tie Bolts for the rear leaf spring on the 1928-31 AA Truck. Spring Clip Spacer 1928 to Mid 1929 AA truck. This plate goes under the rear leaf spring and keeps the U-bolts in place. Spring Clip Spacer for the late 1929-31 AA truck. Shackles for the front of your 1928-29 model AA truck. Come with bushings. Set of two shackles for one spring. These are the foreign made shackles for the rear spring on your model A. One set does both sides. Come with bushings. Also fits 1930-31 AA truck front spring. AA Truck 1928 to early 1931 shackle mount kit . This kit of rivets mounts the frontward shackle on the rear leaf spring to the frame. 8 piece kit. Made in USA. AA Truck late 1931 shackle mount kit . AA Truck Rear Spring Shackle Bolt 1928-31. AA Truck Rear Shackle Bolt Nut 1928-31. Rear spring upper shackle bolt lock washer set for the 1928-31 AA truck. Axle Bumper Set 1928-31 AA truck. A complete kit of the axle bumpers with mounting hardware. AA Truck Spring Pivot Mount Kit 1928-29. Special rivet kit that rivets the rear leaf spring pivot bracket to the frame. Does two brackets. Made in USA. AA Truck Spring Pivot Mount Kit 1930-31. AA Truck Rear Spring Pivot Hardware 1928-29 3/4" Thread. These kits contain washers, castle nuts and cotter pins that hold the rear leaf spring on the pivot bracket. Made in USA. Rear Spring Pivot Hardware 1929-30 7/8" Thread. Rear Spring Pivot Hardware 1930-31 7/8" Thread. AA Truck Rear Spring Pivot Bushings 1928-31. They go in the bracket where the rear leaf spring pivots in the middle. Made in USA. AA Truck Rear Spring Shackle Bushing 1928-31. Goes in the eye of the leaf spring. Made in USA. AA Truck Shackle Bushing 1928-31 for the rear spring. One set will rebush 1 spring shackle. Made in USA. AA Truck Rear Spring Seat Locking Pin 1928-31. Comes with nut and lock washer. Made in USA. AA Truck Rear Spring Seat Pin 1928-31. Gearbox main drive gear for the 1929-47 trucks. This is for the 4-speed gearbox. Made in USA. Gearbox main shaft for the 1929-47 trucks. 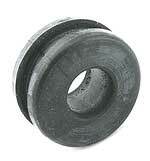 AA-BB Truck Main Shaft Washer 1929-47. Heavy steel washer that gets slid over the splines of the gearbox main shaft. Made in USA. AA-BB Truck Main Shaft Bearing 1929-47. For the 4-speed gearbox. Also used as output shaft bearing on 1948-52 F series trucks when using the Warner T9 transmission with a painted marking on the case 4TA or 4TB. 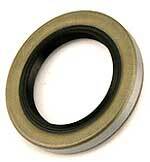 AA Truck 1929-31 Gearbox Bearing Retainer Gasket. 2 required. Made in USA. 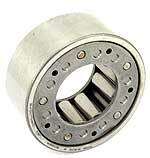 AA-BB Truck Main Shaft Pilot Bearing 1929-47. For the 4-speed gearbox. 1.450" long bearing for the 4-speed gearbox. AA Truck 1928-29 Idler Gear Shaft for 3 speed transmission. AA-BB Truck Reverse Idler Gear shaft for the 4-speed gearbox. AA-BB Truck Reverse Idler Gear shaft 1929-47. For the 4-speed gearbox. Also used on 1948-52 F series trucks when using the Warner T9 transmission with a painted marking on the case 4TA or 4TB. 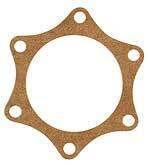 AA-BB Truck 1929-47 4-Spd Transmission Gasket Set . All the gaskets for the AA & BB Truck transmission. 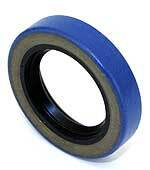 Includes different thickness gaskets for fitting PTO to case. Made in USA. Also used on 1948-52 F series trucks. 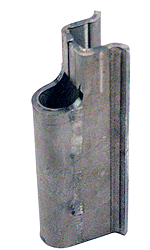 AA and BB Truck Shaft Retainer 1929-47. Holds the countershaft and the reverse idler gear shaft in place. 4-speed. AA Truck 1929-31 PTO Cover Gasket. This is the gasket for the power take-off cover. AA-BB Truck 1929-42 Shift Lever Trigger Spring. AA Truck Shift Lever Latch Rod 1929-31. Trigger Hardware kit for the 1929-31 AA truck. For the shifter rod trigger. AA and BB Truck Shift Lever Latch 1929-42. AA and BB Truck 1930-47 Shift Lever Housing Cap . Threaded cap for holding the 4-speed shift lever in place. AA Truck Trunion/Pin Set 1928-31. These two pins were used for locating the shifting lever in the early AA Truck transmission towers. AA Truck Trunion Pin 1930-31. Later transmissions that had a threaded cap to hold the shift lever in place used this single locating pin rather than the double pins. AA Truck Transmission Cover Gasket 1929-31. Goes between transmission case and the shifter housing. AA and BB Truck Reverse Shift Gate 1929-42. AA and BB Truck Reverse Shift Rail 1930-47. Fits the 4-speed gearbox, 7 1/4" long. AA and BB Truck Reverse Gear Shift Rail 1929-47. Fits the 4-speed gearbox, 5 1/16" long. AA Truck PTO Shim Set 1928-31. A set of various thickness gaskets for shimming the power take-off. AA Truck Collar Pin 1929-31. This pin is for the pedal shaft collar. AA Truck Clutch Release Shaft 1928-31. Fits the 4-speed truck transmission. AA Truck Clutch Pedal Spring 1929-31. Used with the 4-speed truck transmission. AA Truck Clutch Release Spring 1929-31. Hooks onto the throw-out bearing hub and pulls it back away from the pressure plate. Used on the 4-speed truck transmissions. AA Truck Reinforcing Plate 1930-31. When using the AA-13470 tail lamp bracket, this reinforces the mounting bolts inside the cab. Made in USA. AA Truck Tail Lamp Bracket 1930-31. Use to mount the tail lamp to the back of the cab on trucks with dump beds. Made in USA. AA Truck Stop Lamp Operating Finger 1929-31. Mounts on the brake pedal rod and actuates the stop lamp switch. This style was used from mid 29 through 1931. Made in USA. AA Truck Stop lamp Actuator 1930-31. Mounts on brake pedal rod for actuating the stop light switch. This chain style was used from October of 1930 through 1931. Made in USA. The later style AA-Trucks used these loomed style conduits to run the headlamp wires to the radiator shell. Black loom with correct ends. 2 required. The later style AA-Trucks used these loomed style conduits to run the wires to the horn, the radiator shell. Black loom with correct ends. The mud flaps were a very popular accessory in the vintage Ford days, especially on the trucks. As original with Ford script - 9-3/4 Wide X10-3/4 High. You will have to fabricate your own brackets. Sold each, made in U.S.A.
AA Truck Speedo Cable Support 1928-29. Used on the trucks that used the passenger car #2 cross member. Made in USA. Speedo Cable Grommet 1928-29. This grommet was used on the trucks that used the passenger car #2 cross member. Made in USA. Fit in the frame where speedo cable is routed. Made in USA. AA Truck Speedo Driven Gear 1930-31. This is what drives your speedometer cable. Used only for 30-1's with the 5:14 high sped ratio gears. Made in USA. 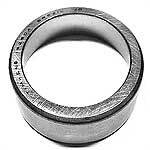 AA Truck Speedo Gear Thrust Washer 1928-31. Made in USA. These speedo cables are longer than the normal ones. They are used on the AA-trucks. Speedo end = 1/8" Made in USA. 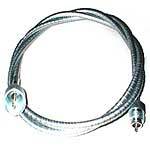 AA-Truck Speedo Cable for the round speedo. These speedo cables are longer than the normal ones, at just over 7 feet. They are used on the AA-trucks. Both ends 3/32" square. Made in USA. AA Truck Mirror Bolt 1928-31. Special dome headed bolt that held the mirror head on the arm of outside mirrors.